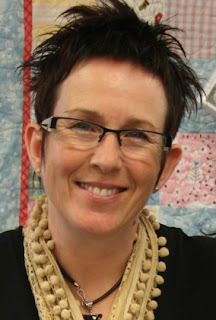 I am Lynette Anderson an Australian designer and I am very excited to be able to tell you about membership to the Lynette Anderson Project Club through Fat Quarter Shop. During the last few years I have had the pleasure of meeting many of you in workshops around the world and I saw the interest for a project club that offered my patterns exclusively to club members prior to them being launched worldwide. 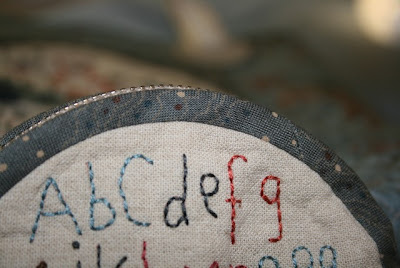 I don't know about you, but I love to be working on smaller projects in between stitching a big project. The frequent need for a gift for a stitching friend, or a swap partner for that swap I just had to join, combined with the huge satisfaction of finishing something, often gives me the much needed spur to continue to work on my big quilt project. The world is changing and I think I speak for most of us; when we want something, we want it today or, if it was possible, yesterday!! I think that downloadable patterns are the answer, they are a great idea and can be obtained instantly and without the cost and often lengthy wait for the postman. For the last few months I have been planning and very busy designing four projects especially for the Lynette Anderson Project Club (LAPC); the four projects will be exclusive to club members for six months for just a one off price of $35. Starting in September 2011 as a LAPC member you will receive one exclusive downloadable pdf pattern via email, the others will follow in December 2011, March 2012 and June 2012. 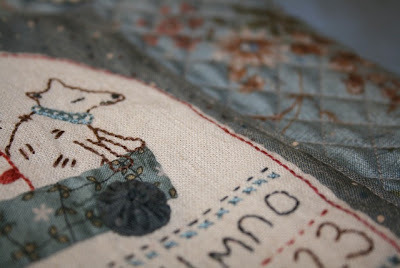 To make things fun Emma, my assistant has been busy taking photos of me stitching so each pdf pattern will also have some step by step ‘how to’ photos for the project we are working on, it will be just as if I was at home with you stitching. Once you are a fully paid up member of the LAPC you will receive a little bonus pattern to keep you busy while you are waiting for the first pdf pattern to arrive in September.